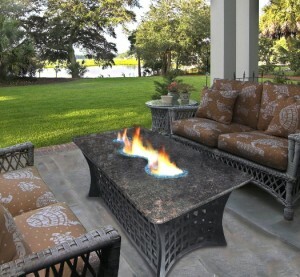 This type of fire pit is the height of a coffee table. It acts as the centerpiece of your furniture area. Available in a square, rectangle, or circle shape, this can be used to place coffee cups, magazines, or anything else you use a coffee table for. But, in the center, you can experience a small fire which will provide warmth and ambiance. 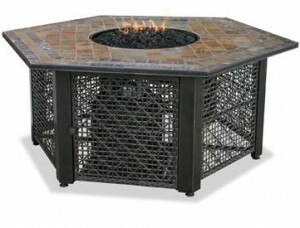 This type of fire pit is the size of a small patio table. Able to seat 2-4 people, you can all have an outdoor dining experience with the best table centerpiece of alla fire. Like a larger than life candle, you can enjoy the center fire pit while dining, or use the table to display appetizers or drinks, and this fire pit table acts as an eye-catching buffet table. Smaller than the dining table, this fire pit is designed at bar height with room for 1-3 people. A great way to add ambiance to a party, guests can enjoy drinks and conversation, or turn this fire pit into an intimate dining experience for two. With these styles, you can not only enjoy the entertainment of an outdoor fire, but you can also use it for a piece of dining furniture outdoors as well! To explore more of these options, click here!